In the 1982 a couple of vineyards settled in Casablanca Valley to cultivate vines close to the Pacific Coast and use this unusual climate to slow ripen some grape varieties, especially some white wine varieties. 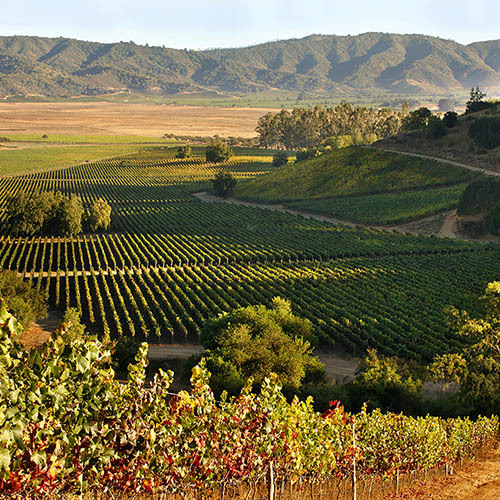 Most of these vineyards have huge terrains, often more than hundreds of hectares and an industrial productions for export business, which made the chilean wine famous worldwide. They offer tours, wine tastings or gourmet meals in their own restaurants. If you are a culinary traveller then this is just the right place for you. We can also arrange cycling tours through the vineyards if you like to ride. Practical Infos: 4-5 hours visit of 2 vineyards of your choice. We will advise you on the many possible options. Tour & wine tasting on the vineyard, meals etc. not included. Included. Private tour, private transport.